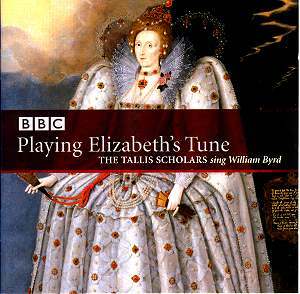 Playing Elizabeth�s Tune is the title of a television programme which The Tallis Scholars made for the BBC. The programme explores the life and music of William Byrd: a Catholic composer in service to a Protestant Queen. The equivalent DVD has a playing time of over 3 hours and includes filmed performances by The Tallis Scholars, a documentary on the composer and over 50 minutes of bonus audio tracks, so that with this CD you know you are only getting highlights. The filmed performances were performed in the beautiful surroundings of Tewkesbury Abbey and recorded in genuine surround sound, but the DVD was not especially highly rated by Robert Hugill on these pages (see review). The stereo CD reviewed here is also available on an SACD Hybrid. The Tallis Scholars have of course recorded the three Byrd Masses before, on Gimell CDGIM 345. While the contradiction in religions between composer and patron might seem intractable, the political and religious situation in Byrd�s time was in fact more settled than in that of his teacher, Thomas Tallis. While Byrd had little option but to conform to the simpler style and English texts required by the Protestant Church, he still managed to maintain his personal voice in works which can be held up as equal in complexity to some of his Catholic pieces. Elizabeth I�s favourite composer took his music for religious services very seriously indeed, and the Magnificat is an elaborate setting whose polyphony goes into eight parts at times. The Mass for 4 Voices was a risky undertaking, the composer single-handedly keeping alive a tradition which had already been closed to composers for some time. If you needed any convincing that this disc is for you, try the Sanctus and Benedictus from this Mass and ask yourself afterwards if you really want to live without it. The deceptive simplicity of the Ave verum corpus concludes an excellent programme of the music of William Byrd, representing the troubled times that produced some of the most intimate and passionate sacred music ever written. It almost goes without saying that The Tallis Scholars produce sublime and moving performances in a beautifully balanced recording. The only comparison I have to hand is the Nimbus recording with the Christ Church Cathedral Choir under Stephen Darlington. This uses boys� voices rather than the female sopranos of the Scholars and, while perfectly acceptable, doesn�t quite hit the eloquent expressiveness of these new performances. The Tallis Scholars have greater timbre and variety at their disposal, and as a result draw the listener more into the inner line and phrasing of the music. The only problem with this CD is that, having heard it, one immediately wants the DVD in order to be able to hear the other two Masses.